A very common expression is “never trump your Partner’s Ace”. In fact, it is the Third Commandment in Euchre. But in this lesson, I will teach you an exception to the rule, where in fact you should trump your partner’s Ace. Let’s look at an example of when you use this rule breaking strategy. After the cards were dealt, West, North, and East passed. South examines his hand, and he sees that he will have 4 trump after he picks up the 10 . He is only two cards away from 4 points. South decides to go alone, and discards the 9 . West leads with A , and East shocks the table by throwing down the Q , trumping his partner’s Ace. One could only imagine what is going through South’s mind, if never saw this scenario before. Many questions are going through his head like “why would you knowingly waste an Ace and a trump? Does East know how to play Euchre?” South takes the trick with A . South then plays the J , forcing him to know the location of the Right Bower. West plays Right and East lays off with the 9 . West, keeping track of which trump cards that have been played, plays the K . East plays the 10 and South follows suit with the 9 . West then plays Q , East his J , and South Trumps in with his 10 . The score is 2-2. South plays his last card, the K , and it does not hold since East has the A . South is Euchred. Since East trumped his partner’s Ace, South was forced to play a card he couldn’t afford, the left bower and A . By disrupting South’s hand, it was impossible for him to win three tricks. Could have South played better? The simple answer is no. South was Euchred when East trumped his partner’s Ace. Even if South gave up all hope of earning 4 points and played the K instead of A , he still could be Euchred. East would likely play his A , and South would play one of his trump cards. If South trumped with the 9 or 10 , West would easily win the trick with his K , and then Euchre South by playing the J . If South trumped with J or A , West could secure the 2 points, by playing K or Q . Playing one of these cards is not easy to find over the table, but it is not impossible to either. If South led with 9 or 10 , West would easily with the trick with his K , then Euchre South by playing the J . If South led with left bower, West would trump with right bower, and Euchre South by playing the K . In all cases, South is Euchred with best play. You should trump your partner’s Ace on two conditions. 2. you should only trump with the Queen, King, Ace, or Left Bower. If you trump your partner’s Ace with the Right Bower, 9 or 10, you won’t likely change the outcome of the hand. Therefore, you should play another card. This Euchre strategy looks illogical, but if you play this lesson several times at home with a deck of cards, you will quickly learn that East played the only card that allowed his partnership to win. Beginner Euchre players are only concerned with how many Trumps and Aces they have, because they think those are the only cards that can win tricks. Even as they learn various Euchre strategies, they fail to appreciate the remaining cards in their hand. They simply look at their hand, and think “I have two trump, an Ace, and two cards that are worthless.” They fail to take time and learn how to use doubletons properly. In this lesson, we will learn how to make the most of your Doubletons. You will learn how to squeeze an extra trick, and to make that last minute stop. The diagram below displays the 15 Doubletons that exist in a game of Euchre. Instead of naming each one individually, we can group doubletons into 2 different categories, Runners and Protected cards. A runner, sometimes referred to as an Ace-Runner, is any set of two cards where one of the cards is an Ace. This doubleton is extremely effective if you or your partner calls trump. You are able to win a trick with the Ace, and then follow it up with the “runner” to win the second trick. Let’s look at simply example of a runner in action. South tells the dealer to pick up the 10 , and says that he is going alone. South leads both his bowers and West play both his trumps, and East discards the 10 and J . South realizes that nearly all the trump have been played, except for the outstanding Q . South plays the A . West plays the 10 and East the K .
South has earned one point, but now is going for 4 points. Since he played his Ace, it cleared most of the clubs out of play, He then “runs” with the 9 squeezing out an extra trick. East and West are powerless to stop South, because they don’t have any trump nor clubs that can beat that once lowly nine. South then played the 9 earning the 4 points. The key to working with any Runner is to play the Ace, and only then play the “runner” at a time when it has an excellent chance of winning a trick. Obviously, this was a very simple example given, but if you learn to apply the technique of using a runner to more complex hands, you will start to notice that you will win that extra trick. All of the “Protected” Cards are played in a very similar fashion. When the first time the suit is led, you want to play the lower ranked card, in order to use it as a sacrificial lamb. Then when you regain the right to lead, you want lead the “Protected” card. Given that nearly all of the trump have been played, it will be the highest ranked card. Allowing you to win that necessary trick. Let’s modify the above example. I have swapped two clubs around giving North the A , East the Q and the South has the K .
This time south does not go alone, but still tells the dealer to pick up the 10 . Again, South leads both his bowers, forcing West to play his hearts. North plays Q and K East gives up his 10 and Q . South then leads the 9 , knowing two outcomes can happen. Either North will have the Ace and win the trick, or it will force his opponents to play the Ace. After South led the 9 , everyone followed suit, and North wins the trick. The point is made, but North and South are going for more. North then leads his 10 , East plays his J , and South trumps it his 9 . West plays the A . Since South led his 9 , and all of the trump have been played. South leads the K , knowing that nobody can touch it. Given North and South two points. North and South have been having all the fun. Now let’s change the same example slightly again, and lets see how East and West can stop North and South from making 2 points. The example below has now given K to East and South now has a “Protected Jack”. North has the A . West now has a “Protected Queen”, and he will use this to Queen to stop North and South from earning 2 points. South again tells the dealer to pick up the dealer to pick up the 10 , and he leads both bowers. West follows suit, and North give ups the Q and K . East plays the 10 and J . South then leads the 10 in order to draw out the other clubs, in hopes of “running” with the J . West plays 9 . Notice how West avoided the trap of playing the Q . The queen will not likely win the trick, so West should play this card “Second Hand Low“. North dumps off is A . East follows suit. North leads the 10 and East follows suit. South trumps with the 9 and West plays the A . South then plays his last card the J . West plays the Q , and stops North and South from earning that extra point. It may seem like pure luck that West was able to stop South, but this is not the case. East was able to recognize very quickly that the 9 should be played because North or South could eventually lead the J . One card may not seem like a big deal, but in this case, it was the difference of an entire point. Using doubletons in order to stop your opponent from gaining their 5th or even 3rd trick is not a rarity, in fact it happens quite often. The important part to remember is that each card led, especially by the maker, has meaning and a purpose. In order to make these point saving stops, remember which suits was led by your opponents. It is likely they have a “runner” or a “protected card” with them. Also, you should discard suits your opponents are void in. If your opponents don’t have any clubs, for example, then you should be void in clubs as well. You should protect cards in your hand that your opponents are likely to have. This will increase your chances of stopping your opponents. Best of luck to you, in using your doubletons. Euchre is a positional game, perhaps more than other card games. The up-card provides information during the bidding process. This information will increase or decrease the relative strength of your hand. Position is determined by the dealer. The player sitting to the left of the dealer is called first seat or first base. The dealer’s partner is called second seat. 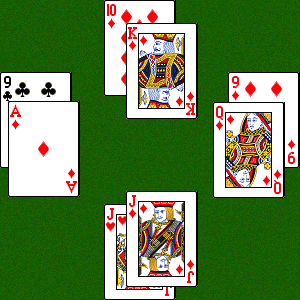 The player sitting to the right of the dealer is called third seat. There are two axioms to consider when applying positional strategy in euchre. The first is the rank of the up-card, and the second is the aggressiveness of your opponents. The higher the rank of the up-card and the more aggressive your opponents are at bidding, it will greatly increase or decrease the relative strength of your hand. The first seat is a difficult place to call trump. It has has the least amount of information to call. It gives the dealer a trump card and the ability for him to create voids. On the other hand, the first seat has the ability to lead the first card, which has its obvious advantages. To order up from the first seat, you should be holding a nice hand. Since the dealer has an improved hand, it is useful to have an extra trump or ace. If the first seat is going to call, going alone should be strongly considered. If you are sitting in the the second seat, you should instinctively try to call trump, because it would give your partner a trump card. This advantage enables the second seat to call riskier hands than normal. The only exception to calling a biddable hand from the second seat is outlined by the Eighth Commandment of Euchre: Ordereth not the right bower unto thy partner’s hand unless thou canst go alone. Do not call from this seat unless there are three guaranteed tricks, otherwise pass. The third seat is the hardest seat to call, because you improve the dealers hand, and you must rely on your partner to lead trump. In addition, the dealer can easily finesse at least one trick, and thus making it harder to win from this seat. If you are the dealer, you should instinctively bid trump. The dealer is technically playing with 6 cards, and inherently, the seat has the most flexible hand. You can easily create voids, or discard the least valuable card. Even slightly risky hands should be considered, because it doesn’t allow the player sitting in the first seat to name trump. After the dealer has turned down the up-card, a lot of information has been gained. The first seat has gained that the opposing partnership is weak in the same color suit as the up-card. 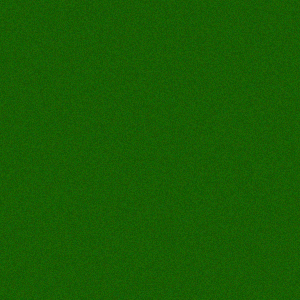 If the two players are weak in one color, then they are likely stronger in the color opposite of up-card. Therefore, the first seat, when possible, should call trump in the “next suit”. This is called a next strategy. The stronger the up-card, the more effective it is to call next. If you call trump in a color other than next, do not expect a lot of help from your partner. The second seat should adopt a “reverse next strategy”. If your partner couldn’t call trump with the up-card, your partner is likely weak in the same color as the up-card. Therefore, you should call trump in color opposite of the up-card, often called “reverse of next” or simply “reverse next”. Calling trump in the next suit can be done, but don’t expect any help from the dealer. If you are sitting in the the third seat, you should adopt a “Second-chance Next Strategy.” In general, your partner wanted to call next, but their hand may have been to weak to call. So the third seat has another opportunity to call next. Your partner will likely have one or two cards in the next suit, and therefore it would make it easier for your partner to lead trump. Calling trump other than next is very risky. If the bidding has comeback to you for a second time, you should adopt a “Second-chance Reverse Next Strategy.” In general, your partner wanted to call a suit reverse of next, but their hand may have been to weak to call. So you have another opportunity to call reverse next. It also should be noted that the cards are very evenly distributed, and the Aces will likely go around the table without being ruffed. If the dealer’s is too weak to call a “Second-chance Reverse Next” suit, simply pass, but if you are playing stick the dealer, you should pick trump which maximizes the number of trump cards and off suit Aces. The Strategy of Calling Next or Hoyle is a simple concept that can be used to great effect in your games. Next is the other suit of the same color as the up-card. For example, if the suit of the proposed trump was Spades, then Clubs would be the Next Suit. After the dealer has turned down the up-card, the player sitting left of the dealer would Call Next, making Clubs Trump. Next is an aggressive strategy against aggressive players. The more aggressive your opponents are at calling trump, the more effective Calling Next will have on the game. The higher the up-card, the more effective it is to Call Next. If the dealer turns down a bower, it almost commands the person to the left to Call Next. Even if that person doesn’t have a great hand, that player should Call Next. The logic of Calling Next resides in the idea that your opponents don’t have the Bowers or can’t use them effectively. If your opponents don’t have the bowers, then they are buried or in your partner’s hand. If your opponents have one of bowers, they are likely to be unsupported. Leading trump should pull the bowers out of their hands, leaving you and your partner with the remaining trump cards. Was it a Bad Call? Rather than start complaining about the cards, which would violate the Tenth Commandment of Euchre, or their partner, which is poor sportsmanship, you should analyze the entire hand. If you determine the hand played was a Bad Call or Bad Execution, then use it at a learning experience for you and your partner. If it was Bad Luck, then keep it as reminder that you are playing the best euchre possible. Let’s look at an example to determine if was a Bad Call, Bad Execution, or Bad Luck? After the deal, East Passes, and South tells North to pick up the A and discarded the 9 . The Call: From South’s point of view, he has 3 trump cards, and North will have at least one trump and an improved hand. You should never underestimate the dealer improving their hand; it is simply a powerful play in euchre. South doesn’t know where the 3 remaining trump cards are located, but he realizes his partnership has the majority of trump cards. Verdict: South simply made a solid call. What can be more wrong than knowing your team has the majority of trump cards with an improve hand? It may have been slightly more accurate for North to discard the Q , because North is voluntary stripping the guard of the A . Verdict: Despite the slight inaccuracy, it won’t change the outcome of the hand. Try it out for yourself. East leads off with the A , everyone else follows suit. East leads off the K , South Trumps with Q and North follows suit. Verdict: It doesn’t matter which card South tosses out, West will play the right Bower. North must follow suit. West Leads off the A . North plays the A , and East Trumps over the Ace with the left Bower. South follows Suit. Fate is sealed! East and West have euchred North and South. Rather pointless, but North/South will win the remaining two tricks. Verdict: There was nothing that North could play to stop the other Bower. North/South had 5 of the 7 trump cards, and yet they still got euchred. Many you will claim that North/South lost because they lack the bowers, but that couldn’t be further from the truth. North/South lost because East/West were able to coordinate their cards. If you look at the hands, East held 3 hearts and West held 3 Diamonds. This disparity allowed East and West the able to not follow suit, other than Spades. Their trump cards were never in jeopardy of being played during the same trick. If East had played a Heart Instead of the A , South would have likely played the natural Q , and North/South would still have been euchred. In fact, South would have needed to play the very uncanny 10 to win that scenario. Verdict: Bad Luck! While it is rare for a team to have coordinated cards, it is not completely uncommon. The vast majority of time, when a team has 5 out of 7 trump minus the bowers, the defending team will not be so lucky. A classic strategy in euchre is Second Hand Low. The strategy is a trust play that allows for a partner a chance to win a necessary trick. It doesn’t always work, but it could mean the difference from winning two points instead of one. East leads off with the precarious . There is no way that East believes that the Q will make it around the table, and it is obvious that East is getting rid of a singleton card to become two suited. The question remains for South who is holding the ace. If South trumps the Q , South could potentially ruff a winning A from North’s hand. Not to mention, South will only be left with one trump. Leaving any remaining tricks defenseless. South ended up playing the hand low with the 9 , leaving a 50% chance of North winning the trick. South will eventually have to play 9 , leaving an entire trick up to North. What better time will South have in order to let North win a trick? Besides, if North doesn’t win the trick, South will still have two trumsp and an off-suit ace win 3 tricks. The strategy of Trumping In is the exact opposite of Pulling Trump. The main idea behind Trumping In is to allow for a partner to ruff a trick. Generally, the trump maker should pursue Pulling Trump. In some cases Trumping In is the only way to win. Let’s look at an example game to demonstrate when to Trump In. South has named hearts trump. The grand scheme for South is to ruff East’s lead with the A , pull trump with the J , and follow through the A . If needed, South may depend on North ford help. East leads off with the K . South follows suit with the A . West trumps with the Q , and North follows suit. Obviously, plans did not go right for South. East leads the A , and play proceeds with the 10 and the 9 . South trumps with the A . Currently, South is holding J and 2 losers. South desperately needs for North to win a trick. Leading the J would pull the remaining trump from East and West, but it could also pull a winner from North. South needs to keep as much winning material in play, and allow for North to Trump In. South leads the 9 . Play proceeds with the K , the Q , and the Q . West then leads the 10 with North following suit. West ruffs with the 9 . With the trick score already 1-2, South must play the J if there is any chance of saving the game. South plays the 10 followed by West’s 9 . Finally, North is able to Trump In. There are two doubletons in North’s hand, the A-9 and K-Q . The the lower ranking card is said to guard the higher card. In this case, the 9 guards the Ace, and the Queen guards the King. Typically the guards are used as a waiting card in order to keep the stronger cards, but the role of the guard can be changed into an offensive weapon. Lets look at an example game to see this tactic. South calls up the 10 and discards the 9 . West is in a dreadful position. Leading trump when defending, usually benefits the trump maker. If West leads any club, it will likely be ruffed. Therefore, West is forced to play the K . North plays the A , and wins the trick since East and South must follow suit. Many beginners would play the A hoping the card makes it around the table, but North fires back and throws out the 9 . The once lowly guard of the Ace will change roles and go out on the attack. North realizes that since there are only two more spades left in play, South has a strong chance to trump the 9. In fact, South has a stronger chance of winning the trick than the A making it around the table. Play proceeds with West following suit, South played 10 , and East played 10 . North and South went on to score a point. Pulling Trump is a basic strategy in euchre. The basic premise of the strategy is to clear the table of all trump cards and win any remaining tricks with their off-suit. Pulling Trump is especially effect the trump maker has an off-suit Ace. In general, the partnership that makes trump should play it as quickly as possible. Let’s look at an example game to see this strategy in action. South is in an excellent position, and the player has many tactics available. South decides to pass and use the advanced euchre strategy of Passing Dirty. West, North, East also pass. South declares diamonds trump. While the idea Going Alone is tempting, it is far to risky at this point. South leads off with a Double Bower Blast. In one fell swoop, all seven trump cards are wiped off the table. Without fear of being ruffed, South then leads the ace clubs. East and West follow suit, and North plays the queen of spades. South then plays the last two clubs, and no one is able to make a stop. North and South take a two points and go on to win. Euchre Strategy Poll - Do you Call or Pass? The score is 9-5 in favor of your opponents. Your partner turns up the 10D. Do you Call or Pass?